THE main god associated with Neptune is his son Triton, and is the given name of the odd-look largest Neptunian satellite. Triton is the god messenger of the deep oceans and seas, who routinely is portrayed as half-man and half-fish, being akin to the modern day mythological merman. Seated in his undersea golden palace, Triton holds a shell-horn or conch shell, whose generated sound calls create the waves on the shore, or if angered, a tumultuous sea. In fact, all the moons of Neptune have names adopted from the many water and sea nymphs, who are imagined as either spirits or higher beings than Man, but never as true gods. The word nymph literally translates to mean “the young maiden”, who are generally very shy and aloof from Man, and hide in all the places within the Earth’s natural environment. These can be in either glades, waterfalls, hills, forests or rivers and streams, etc. In the middle-ages they are equivalent to the fairies, and similarly are placed within these many diverse groups. Of the water and sea nymphs, the three main groups associated with Neptune and water are the Naiads, the Nereid and the Oceanides. (a.) Naiads were said to be usually associated with rivers, waterfalls and lakes. Although not really directly associated with the sea, they are often connected with places of fresh water. They are said to reside near the source of the water supply, and can die, but only when the water source becomes dry. Unlike the gods, they must never live the places they look after. The classical Naiad is the spring nymph Arethusa who causes water to rise from within the Earth. Another is Styx, whose river is the most sacred and holy as it transports the dead to the underworld. Most of the Naiads are view as lesser in importance, whose names are not very common in the story of ancient mythologies told today. Other Naiads include Minthe and Syrinx. (b.) Other sea nymphs were the Nereid, who were deemed as sea goddesses and whose main responsibility was to protected and save ships from being smashed by rocks during storms in the Aegean Sea. Their father who was born from the sea was Nereus — the righteous and wise, and the proverbial basis of the “Old Man of the Sea” — Their daughters totalled fifty in number, whose mother was the Oceanides nymph, Doris, who had long wild-like blond hair. Highest of all the nymphs was beautiful Calypso, the daughter of the Titan, Atlas, who in Homer’ ‘The Odyssey’ held Odysseus prisoner for seven years. These nymphs were also sometimes deemed troublesome, like Siren and some of her accompanying sisters, who were called collectively known as The Sirens. The Sirens are popularly portrayed in the grand Odysseus legend, as the ones to mesmerise of seamen by their sweet seductive mesmerising voices hauntingly calling them to be killed on the nearby rocks and shoals. (Odysseus saved himself by being tied to the mast of his ship.) Another famous Nereid is Thetis, the mother of the Greek hero, Achilles. Others include; Galatea, and the latest discovered moon of Neptune, Psamathe. Most of the Nereid later became the associated legends of modern sea mermaids. (c.) The third is the adopted Neptunian ones are the Oceanides nymphs. These were the forty daughters of the Titan god, Oceanus. Oldest of the Oceanides was Rhodes, though some later writers also accredit her as the daughter of Neptune (Poseiden) and Amphirite. Examples of other Oceanus nymphs were Calypso, Doris, Methis, Styx, but the most celebrated of all, was Tyche, the goddess of good fortune. For many years, only two moons were known to encircle Neptune, Triton and Nereid, which may be formally termed as the classical moons. After Voyager 2 this number became seven, and the decade or so after its brief encounter with the planet, the Neptunian moon system totalled eight (2001). Additional careful Earth-based observations during 2002 and 2003 have brought the new total to thirteen, which still stands at the time of writing. Triton is the largest moon, which was visually discovered on 10th October 1846 by the English amateur astronomer William Lassell (1799-1880), merely 17 days after Neptune had been found. Overall Triton is roughly one-third by mass, whose distance is only about fourteen times the diameter of Neptune or about 25% smaller than the Earth-Moon distance. Oddly the circular orbit moves in the opposite direction from all the others satellites, completely orbiting in just 5 days 21 hours. Voyager 2 brief encounter discovered much of what we know know about Triton. This certainly is an interesting world, whose surface looks like fruit of the rockmelon or cantaloupe. One of the first observations is the very cold temperatures, which hover around −230° to −240°C or just 30° above absolute zero (0K). You would expect such large moon within the very depths of the solar system would be inert and quite uninteresting. Yet amazingly, this moon that has many dark spewing volcanoes, that ejected dust particles and ices of nitrogen and methane as it is expelled from the interior of Triton. These plumes fire material as high as 8 to 10 kilometres above the surface of Triton, only to fall back as dark snow-like flakes or particles, as they slowly drift in the thin zephyr breezes in the upper nitrogen-rich upper atmosphere. A source for the energy to make Triton so active in not understood, but the culprit could be the tidal gravitational forces tugging between Triton and Neptune or internal heat sources. Some other surface spots are dark where it seems ice and rock are mixed and flow out onto the surface. Others areas near the moon’s equator show greenish tinges whose origin and composition is unknown. From Neptune cloud-tops, Triton appears almost the same diameter as the Earth’ Moon and varies little in apparent diameter. The near circular orbit is retrograde and because of the high inclination of 156.8<°to the ecliptic, and always shows phases from Neptune and can never reaches ‘Full Triton’. With an orbital period of 5.88 days (5 days 19 hours), the changes in phases would be quite noticeable each hour or so. Much discussion continues about the origin of Triton, whose highly inclined orbit suggests it was independently captured by Neptune sometime in the distant past. It could also explain the mess of the outer orbits of Neptune. Almost contradicting to this, however, is the near circular orbit and is lock-in synchronous rotation. Since the new outer moons have been discovered, there could additional theories supporting or deposing this idea. 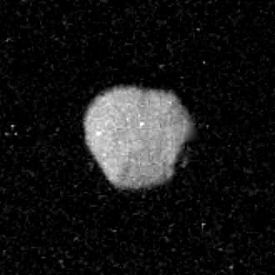 Triton can be seen in 25cm (10-inch) telescope when at maximum distance from the planet,and is roughly about 13.5v magnitude at opposition. 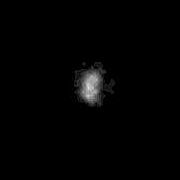 Nereid is the small Neptunian satellite that orbits in almost exactly one whole Earth year. Discovered by Gerard Kuiper on 1st May 1949, this odd 170±25 kilometres moon has the highest orbital eccentric (0.751) of any of the other planets or known moons within the entire Solar System. Taken from 4.5 million km. Planetary scientist believe Nereid might have been captured as either an asteroid of Kuiper Belt Object (KBO) by the gravitation of Neptune. Orbital analysis for such captures are is likely to also involve the much larger Triton, deflecting and slowing the motion enough so Nereid can form a stable orbit. It is unlikely we will solve this mystery from Earth, so it will rely only a future returning orbiting unmanned spacecraft to study the whole Neptunian system. Even if one mission could be sent tomorrow, Neptune is extraordinary far away at 30 AU. Basic calculation shows you could get a standard propulsion spacecraft there in orbit in the minimum duration of about 11.7 years. A return sample mission would exceed 17.4 years at best! At the moment there are no planned missions to Neptune. This moon, imaged by Voyager 2, is the second largest of all the Neptune satellites, whose diameter is 416 km. Taken from 870,000 million km. All the six inner satellites (II to VII) were discovered by Voyager 2, being close to the planet and associated with the rings. Voyager found these were found 1989, and were originally labelled as S/1989 N1 through N6. Largest is VIII Proteus (1981 N1), which averages some 416 kilometres across. (See Figure 5) In distance from Neptune, Proteus at 117,647 km. is about half that of Triton, whose period is 1.122 days (26 hours 54 minutes). The image is exposed longer than most moons, as it seems to be very dark, one of the darkest in the Solar System. As such, this small body more like the comets or Saturn’s moon Phoebe, being similar in albedo to black soot. The shape of this body is irregularly shaped, with clearly a large impact crater to the right limb. After Proteus is then followed, in decreasing order of size as we approach the Neptunian atmospheric tops. Four main satellites are; Naiad (III), Thalassa (IV), Despina (V) and Galatea (VI), and are all associated with the darkened rings, and like them, all these moon all have near circular orbits. Like Proteus, they are all oddly shaped and cratered, suggesting they have been in stable orbits whose orbits. All are aligned with the planetary equator. Despina probably has the most significant influence of nearly all of the rings. However, Larissa (VII) lies just beyond these rings, and arguably could be considered the boundary to the middle or traditional satellites of Triton and Neried. Most of these small satellites remain invisible even in the largest of telescopes mainly because of the proximity to the planet versus, the considerable distance from the sun, and the notable weakness of solar light. Magnitudes range from 20th for Larissa (VII) to 24.1 for the inner-most moon Naiad (III). Detailed Earth-based observations during 2002 and 2003 have discovered five more moon that extend well past the orbit of Nereid. These were found using deep images of the surrounding area around Neptune. Most of these are about 40km to 60km in size. The last named moon was the tenth moon, Psamathe was previously designated S/2003 N1. The others are yet to be again optically verified and named by the IAU. Inner most is Halimede (IX or S/2002 N1), whose orbit is which highly elliptical and is high inclination (134.1°), thus making the orbit as retrograde. The next two are Sao (XI or S/2002 N2) & Laomedeia (XII or S/2002 N3), which are very similar many respects, including their distances from Neptune. Both are moderately inclined to the ecliptic at 48.5° and 34.7°, respectively, differing significantly from all the other moons. Perhaps the most extraordinary are the more recently discovered Psamathe (X) and Neso (XIII or S/2002 N4). Both lie almost one hundred times further than the Moon does from Earth, whose periods average 25.0 and 25.7 years, respectively. Both have retrograde orbits, and share very similar orbital inclinations. This also is slightly different from Triton, but shares almost the same inclination as Halimede. Most of these five newly discovered satellites are amazingly faint, lying between 25th and 26th magnitude. None are telescopically visible from Earth, and can only be found using deep-sky imaging. There is much debate on the nature of the Neptunian satellite system, because the outer orbits are so different in inclination. Seemingly, they defy what would be expected, making it difficult to understand how these bodies were first formed. The story of Neptune’s rings also begins when the planet was discovered. William Lassell at the same time that he found Triton, reported that he though he saw rings orbiting the planet. His observations seemed quite peculiar, as he could confirm the direction or size of them. After much debate and discussion, especially as other could not confirm Lassell’s view, the problem was resolved by problems with his telescope having gross distortions. From what we know from Voyager 2, it would have been impossible to see them. This story remains today as a unusual observational curiosity. The rings are unusually named after Neptune astronomers and even the partial ring. The nomenclature deviates significantly from the naming systems used for the rings of Jupiter and Saturn, and the Greek letters for used Uranus. Some rings even have names after the French ideals of their republic! Neptune’s rings vary between 41,900 and 62,900 kilometres, being some 0.5 to 0.7 times of the diameter of the planet. Like Uranus, these rings are mostly dark material. From increasing distance from the planet, the Voyager 2 rings are named Galle, Le Verrier, Lassell, Arago and Adams. (Arego being named after François Arago, the French astronomer who first seriously began the hunt for Neptune. The outer ring at the distance of 62,900 km, is named Courage, with the bright portions of the partial ring arcs being Liberté, Egalité and Fraternité*; (liberty, equality and fraternity). These fragments being in the order of leading, equidistant and following, respectively.